Citation: C N Trueman "James ‘Ginger’ Lacey"
James ‘Ginger’ Lacey was one of the most successful aces of the Battle of Britain in 1940. In fact, Lacey was in a very small elite group of triple aces – such was his success. Lacey was born on February 1st 1917. He attended King James Grammar School in Knaresborough. He left school in 1933 and for four years worked as an apprentice pharmacist. In 1937, as war clouds started to darken over Western Europe, Lacey joined the Royal Air Force Volunteer Reserve. He trained as an instructor and was called up when war was declared in September 1939. In May 1940, 501 Squadron transferred to France in an effort to support the BEF and the French Army in their efforts to stop the onslaught that was Blitzkrieg. Lacey scored his first kills on the afternoon of May 13th when he shot down a He-III, a Me-109 and a Me-110. Between this date and June 19th 1940 (when 501 Squadron returned to the UK) Lacey shot down two more He-III’s. For his work during the Battle of France, Lacey was awarded the Croix de Guerre. Throughout the Battle of Britain, Lacey remained with 501 Squadron. He was based primarily at Gravesend or Croydon fighter bases. Lacey made his first kill of the battle on July 20th when he shot down a Me-109. It was the first of many kills and on August 23rd he was awarded the Distinguished Flying Medal. His success continued throughout September. On September 13th he found even more fame as he shot down one of the He-III’s that bombed Buckingham Palace. However, Lacey did not always have things his own way. Between May 1940 and the end of the Battle of Britain, Lacey bailed out of a stricken aircraft or crash-landed one on nine occasions. On each occasion he sustained either no injuries or only minor ones. On November 26th 1940, Lacey was awarded a Bar to his DFM. In January 1941, after the end of the Battle of Britain, Lacey was given a commission and promoted to Acting Flight Lieutenant in June. The intensity of combat flying in Western Europe changed after the Battle of Britain ended. The Blitz entailed mainly nighttime raids and, as yet, fighters in the RAF could not successfully fly at night. 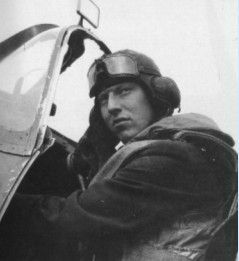 Lacey’s reputation as one of Britain’s top aces, meant that he was much in demand as an instructor. In 1942 he became a Tactics Officer and later in the year a Chief Instructor at No 1 Special Instructors School. In 1943 Lacey was posted to India. He stayed there for the rest of the war. On February 19th 1945 he shot down his final kill – a Japanese ‘Oscar’. ‘Ginger’ Lacey was one of a very select group of RAF pilots who could claim not only to be aces but also, in his case, to have been involved in World War Two from the day war was declared – September 1939 – to the day war ended – August 1945. Lacey was awarded a permanent commission in 1948 and remained in the RAF until his retirement in March 1967. He then worked in the airfreight business. James ‘Ginger’ Lacey died on May 30th 1989.